In fact, I remember Eric Alexander telling us students in a masterclass that when he first saw the Omni Book, he thought that it was a conspiracy. That no one could possibly have played solos this perfect without writing them out first. His musical intuition somehow guided him from one perfect line to another, coming up with what seemed like endless perfect melodic ideas. 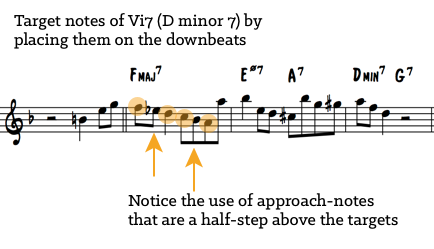 Today, we’ll take a look inside the genius mind of Charlie Parker, uncovering some of his secrets to playing over Confirmation. Have a listen to the tune a few times and take a look at the changes to Confirmation. Can you hear the changes? Pay attention to the slight differences between the first and second A sections and the use of ii Vs to travel from one place to another. The changes are not actually that daunting, I mean, it’s not like they look like a Wayne Shorter tune. 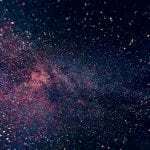 So why do Confirmation Changes trip you up and what can you do about it? This series of quick ii Vs, coupled with the minor ii V in measure 2 make it a tough task to come up with a flowing lyrical line from one measure to the next. These first few measures are the key to the WHOLE tune. Why are they the key to the tune? 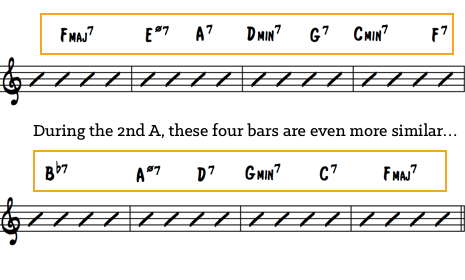 As you can see, measures 5-8 of the A section are a very similar progression to measures 1-4, just starting from the IV7 chord. Look at the root motion and the chord qualities. The form of the tune is AABA, so by conceptualizing this “ii V walk-down” as I’ve been calling it, you’ll gain freedom with most of the tune. So now that you have a basic understanding of the changes, let’s dive into some of the specific problems you may encounter while learning to improvise over Confirmation. There are subtle things about the progression that make it especially tricky. 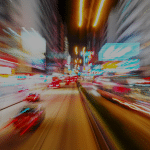 By breaking each problem down, one at a time, and understanding Bird’s solutions, you’ll soon realize how you can get through these changes with ease. Despite what people think, playing over major chords is not easy. Sounding boring or running up and down a scale is easy, but creating a singable melody over a major chord is not as straightforward as you might think. Luckily, Charlie Parker gives us a hint of how we can approach this problem. 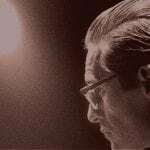 Instead of adhering to the common mantra “stick to 3rds and 7ths” and “use the major scale,” in the first phrase we’ll look at, Bird emphasizes the 6th (D) and uses an Eb chromatic passing tone. This goes against what we’re generally taught about major chords. What on earth could he be doing? This little trick we actually divulge in Melodic Power because it’s so powerful over major chords. This one technique if practiced in the right way, can open up a wide variety of melodic possibility that you never noticed was available before. Instead of focusing on the major chord-tones, simply focus on targeting the Vi minor chord-tones. 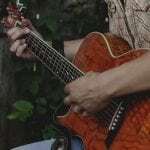 Major chords are generally a “home” in the harmony. They’re a static harmonic place, making it difficult to give your melodies a sense of forward motion, pushing to the next chord. When you’re coming into any of the A sections moving into the I Major chord, you can play a line leading into the tonic chord, to help you create forward motion on the otherwise static chord. For this to work, think of “playing through” the changes instead of “playing on-top of them,” with the goal of extending your line into the bar of major. One of the defining elements of this tune, but something you see in other tunes like There Will Never Be Another You and quite a few others, is the tonic chord moving to a minor ii V starting a half-step below (F major to E half diminished A7). At first this transition can throw you off, but with a couple strategies in mind, you’ll soon nail this change every time. And, as you probably realized by now, this down-a-half-step-to-minor-ii-V progression occurs with the IV chord in measure 5 to 6 as well (Bb7 to A half diminished D7). Often times, Occam’s razor does apply to jazz improvisation, making the simplest solution the best. 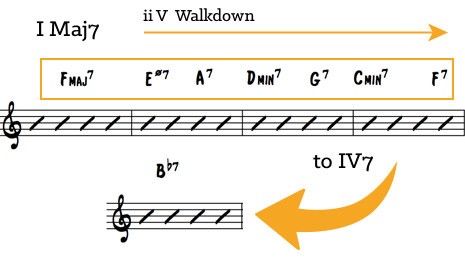 The b5 of a half diminished chord, also known as a minor 7 b5 chord, is the thing that makes it that specific chord. So it would only make sense to emphasize this chord-tone. If all you did when you approached a half diminished chord was think “target the b5 from the measure before,” you’d be heading in the right direction. The other strategy that Bird frequently uses is basically ignoring the half diminished chord and continuing to play in the key from the previous measure. Recall that the notes of the Locrian scale tend to sound consonant over a half diminished chord, and it just so happens that the Locrian scale that corresponds with the half diminished chord in these progressions comes from the key in the previous measure. Now I’m not saying to randomly play the notes of this scale, or to even think of this scale–this is helpful mental information which we drill throughout our Visualization Course–but to understand that the transition from the tonic to a half-diminished chord a half-step below, or from the IV7 chord to a half diminished chord a half-step below, is not actually much of a transition. They share similar notes and knowing this makes moving from one to the other easier. However, how these notes sound on each chord differ entirely, hence, you must know the chord structures and chord sounds. See how Bird barely puts in any effort in distinguishing the A half diminished chord here and continues his phrase as if he’s in Bb? Minor ii Vs are hard for pretty much anyone, until you work on them a bit. And the easiest way to become a master at minor ii Vs quickly? Get some language on them! It’s the most direct and fastest route to playing over these little units that show up everywhere. Rather than having a heart attack every time you run into these little guys, just learn a few pieces of language over them in all keys. With each piece of language for a minor ii V you learn, you’ll gain a unique understanding of how to get from pint A to point B in a musical way. Just take some of these perfect minor ii Vs from Bird. Another solution to the minor-ii-V-problem and resolving clearly to the minor chord is to target the 5th of the resolving minor chord, in this case G minor. And, if you noticed, Parker does this with the previous two lines as well, targeting the 5th of D minor (A). Moving from the first 4 bars to the the 5th bar is kind of a big deal. It’s like a blues. You’ve been hanging out in the tonic key, and now, you’re moving to a new place: the IV7. Making this transition clear and emphatic makes for a strong melodic line. A dead simple way to accomplish this and the way that many great players use? Play simple ii V language in measure 4 to dominant language in measure 5. Don’t have any language or haven’t started transcribing? Not to worry. You can just outline the harmony as Bird does in this line, arpeggiating up the minor chord, coming down the scale, and resolving to the Bb7 chord. It’s more the placement of his phrase and how he’s leading from the ii V to the IV7 chord than the actual notes he’s playing that make his phrase work so well. Another way to solve the problem of getting to the IV7 chord is to anticipate the transitional ii V, the C minor F7. By anticipating this change, you lead the listener’s ear through the transition in measure 4 without even playing a thing. 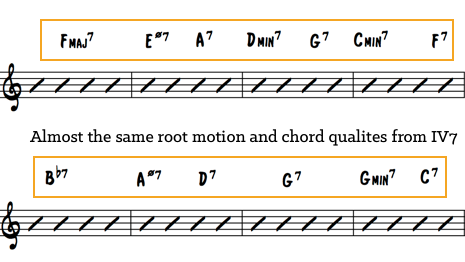 It’s these little subtleties in chord changes that you want to start paying attention to and making sure you’re hitting when you play a tune. 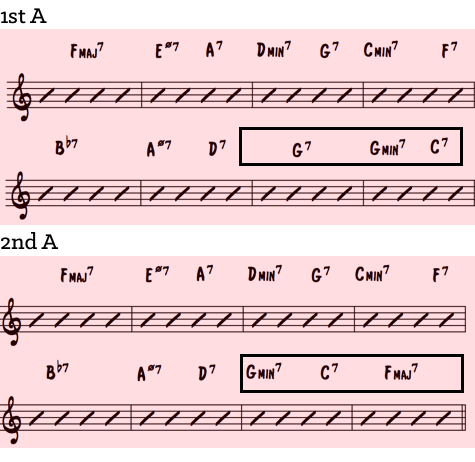 The main change to hit to contrast between the first and second A sections is the II dominant 7 chord in measure 7. One way Bird illustrates this difference is by ending his melodic line by hanging on the #11. 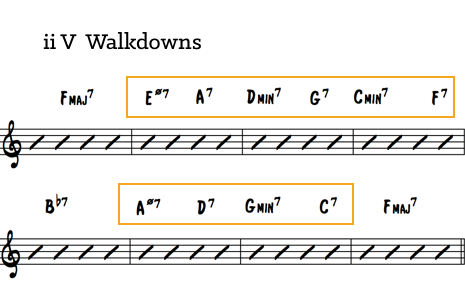 This is a common technique to use on the II7 dominant chord. Of course, you can always resort to simple dominant language if you have some at your disposal. This solution we already saw in 4A, but you can take that same idea and use it here. Remember, everything you learn can be used in many different places and contexts. Nothing is exclusive. It’s no surprise that Bird plays ultra clear minor language, dominant language, and major language. That’s what the bridge of Confirmation takes to play well. We get into trouble when we have limited ability to speak over a particular chord type. Practicing language in all keys for each of these (minor, dominant, and major) and learning to connect them seamlessly will allow you to improvise melodies in real-time over a ii V I I like the bridge to Confirmation. 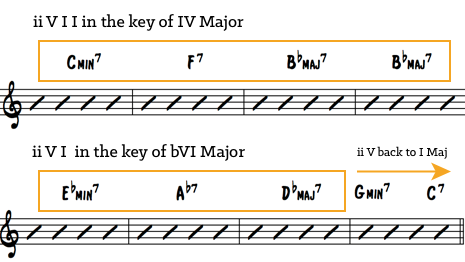 Another way to look at what Parker is doing on the bridge is targeting chord-tones on strong beats, mostly 3rds and roots, and thinking of the next chord, the chord he’s resolving to, in advance. By combining the language concepts you’re learning from transcribing and the mental theoretical concepts you’re learning, you’ll have more than enough melodic, harmonic, and rhythmic information at your disposal to solo confidently over the bridge to Confirmation. This is a complex tune and don’t let anyone convince you otherwise. To play over it well takes years, not months, so persevere and stay consistent. And more than just using the tactics we’ve laid out for you today, observe the process. We began by understanding the changes and conceptualizing the root motion, getting to know what makes this tune unique, special, and tricky. Then, we broke down each problem. Now, these problems are the problems I see from my study, but you might come up with totally different problems. The important point: clearly define the problems you’re having as best as you can. Once we have clear problems, we can transcribe one of our heroes to get a model for how to solve these problems. Notice that most of the solutions we came up with revolve around simple musical devices: using enclosures, targets notes, approach-notes, chord arpeggios, ii V language. If you’re having trouble applying this process on your own, you can kick-start your learning with Melodic Power. That’s the whole reason we built the course: to bridge the gap between theory and transcribing/conceptualizing jazz language. And don’t be fooled by Bird! He makes everything sound easy. Besides the things we went over today, many of his secrets lie in the way he phrases, his sound, his articulation, and his time-feel. None of these things can be written down. If you want to get deeper into what he’s doing over Confirmation, spend some dedicated time every single day for the next few weeks listening to the recording. Then, revisit this lesson and it will help you even more on your journey to play Confirmation!